Roughly equivalent in size to the US state of South Carolina, Scotland is a compact country densely packed with an astounding amount of history, culture and educational ingenuities. Home to several of the oldest and most fascinating universities in the world, Scotland is an excellent choice for students interested in studying abroad. The University of Glasgow, the University of St. Andrews, the University of Edinburgh and the University of Aberdeen are ranked among the highest in the United Kingdom, and provide learners with enriching and enlightening educational options. There are many colleges in Scotland that encourage study abroad students to apply. These four schools have been in operation since the 1400s! Can you imagine the thrill of studying your favorite topics in a castle-like school that's been around for hundreds of years? How about breaking for lunch in a serene brick courtyard surrounded by fabulous mountain and water views? An hour and half train ride will land you in England, where you can visit Windsor Castle - home to the Queen of England - and be back to your apartment in Scotland in time for dinner! You can hop on a plane, or even a ferry, and head west to Ireland to explore this fascinating island, and perhaps even visit the General Registrars Office to trace your roots! Catch another train to the tiny country of Wales, famous for its stunningly picturesque landscapes of mountainous regions framed by the Irish Sea. Some consider the weather in Scotland to be slightly dreary, particularly in the west, with an average rainfall of 180 inches. Despite the rain in some areas, this country's climate is mild; especially when you consider that it sits on the same latitude as Labrador, where the entire sea freezes over yearly! Most years, highs do not reach above about 75 degrees in the summer, and it doesn't generally dip below 40 degrees during the winter. If you've ever survived a freezing Midwest winter or a blazing East Coast summer here in the US, such mild temperatures sound entirely manageable! Packing for Scotland's conditions should be a breeze, you'll need jeans and a medium-warmth jacket. No heavy snow boots to lug around, and if you bring gloves and a hat, they'll probably be gathering dust in your closet. 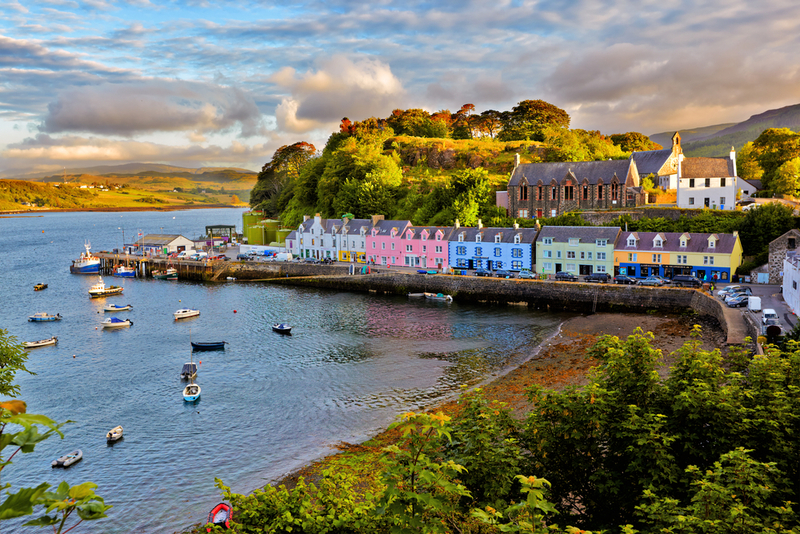 The ideal months to visit Scotland are widely considered to be the summer months of June, July and August. During these times, the days are at their longest with the sun peeking through until well after 9:00pm, and you're much less likely to encounter a daily drizzle. Studying here for summer or fall semester is probably your best bet. Dunnottar Castle in Aberdeenshire was built in the 16th century, and sits precariously atop a cliff overlooking the sea. Wander freely around the deserted barracks, stables, chapels and more as you learn about the land's importance in Scottish history. Just outside Scotland's capital city of Edinburgh, the Royal Yacht Britannia gives visitors an inside look at the famous floating palace that served Britain's royal family for over forty years. Tour the entire ship-from staterooms to ballrooms, engine rooms to the bridge, and live for a moment as famous British royalty. Loch Ness - will you spot the mythical Nessie? Travel to Drumnadrochit and take a gamble! State University of New York (SUNY) offers in-depth programs in nearly every discipline. You can take classes at the University of St. Andrews, the oldest university in Scotland. Nestled amongst the pubs, restaurants and shops of Edinburgh you can study anthropology, history, art, math, physics, social sciences, geography and divinity. Arcadia University partners with the University of Glasgow to bring students-particularly biology students-a well-rounded and focused education. Rutgers offers students of psychology and English literature a first-class education at one of the top research institutions in all of Great Britain. Colleges in Scotland provide fantastic opportunities for learners interested in studying abroad. The first-class educational opportunities, along with endless occasions to learn outside the classroom, it's considered by many to be one of the top destinations for studying abroad worldwide. the University of Stirling offers a wide variety of academic courses for any major, excellent student support services and a vibrant student life with lots of student clubs and co-curricular activities and located in a great university town. Complete research projects this summer at one of the best Medical Sciences programs in the U.K.! The University of Aberdeen offers an incredible amount of courses in nearly every academic discipline you are looking for, including STEM, while maintaining a smaller community vibe.